One of the most significant figures in Christian history was born in 1509 in France, at Noyon in the Picardy area, as Jehan or Jean Cauvin. His later opponents would contemptuously label his followers Picard or later still Calvinist, which was originally a term of abuse. His father, a lawyer, intended him for the priesthood and sent him to the University of Paris when he was 14, but he decided not to be a priest. In his student days he was drawn to the rising tide of ideas that would soon be labelled Protestantism, which believed that the Roman Catholic Church had fallen prey to materialism and superstition and called for a return to the original Christianity of the earliest centuries. He would later write that God ‘subdued and brought my mind to a teachable frame, which was more hardened in such matters than might have been expected from one at my early period of life’. Calvin became so identified with ‘reformism’ that he could not safely stay in France. In 1535 he arrived in Basel in the Swiss Confederation, where in 1536 he published the first edition, in Latin, of his Institutes of the Christian Religion, later known simply as the Institutes. Purporting to teach ‘almost the whole sum of godliness’, it attracted the attention of other Protestant enthusiasts. He published revised editions of it for the rest of his life and it would make him famous. Leaving Basel in 1536 for Strasbourg in Germany, Calvin went by way of Geneva, an independent city just outside Switzerland, which had attracted reformist refugees from France and Italy. One of them, a Frenchman called Guillaume Farel, persuaded Calvin to stay and help to establish Protestantism there. Farel and Calvin were too inflexible for the Geneva city council, which in 1538 ordered them to leave. They went to Strasbourg, where in 1540 Calvin married a widow called Idelette de Bure. Her death only nine years later would be a dreadful blow to him. 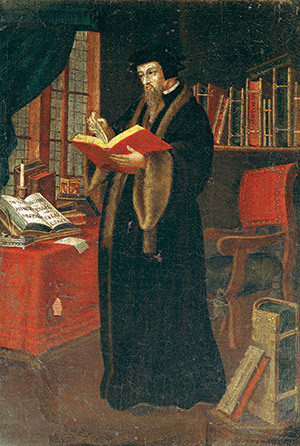 By 1541 Calvin’s reputation had grown to the point where the Geneva council asked him back to put the chaotic religious situation there in order, which he did. He believed that the Protestant Church should be run by pastors and teachers to care for and guide the laity, elders to help the pastors maintain discipline and deacons to run charitable work. Citizens who refused to accept Calvinism were expelled from the city or, in extreme cases, executed as heretics. On the surface at least, Calvin was a forbidding and joyless figure. Although he believed that the very few human beings who would attain salvation would gain it, and were predestined to gain it, through the grace of God, not through leading a good moral life, he took an uncompromisingly austere moral line and sternly disapproved of sexual misbehaviour, drunkenness, ribald songs, swearing, gambling and dancing. As Diarmaid MacCulloch put it in his study of the Reformation, although Calvin enjoyed playing the equivalent of shove ha’penny and an occasional game of quoits, ‘he was not inclined to conviviality … He did, however, relish getting his own way, which he identified with doing the will of God’. Doing the will of God kept Calvin working desperately hard. He preached hundreds of sermons and conducted innumerable baptisms and weddings. He maintained a vigorous correspondence with religious and political leaders all over Europe, as well as writing widely circulated commentaries on the scriptures, including much of the Old Testament and every book in the New Testament except Revelation. In 1559 he founded the Geneva Academy, where students were trained for the ministry, which the Scottish reformer John Knox called ‘the most perfect school of Christ seen on earth since the days of the Apostles’. Protestant immigrants, meanwhile, nourished new industries and businesses and Geneva prospered. Its printing industry was a success for the city’s economy, as well as an efficient Calvinist propaganda machine. The burden of so much work put a growing strain on Calvin’s health. In 1558 he came down with quartan fever, or malaria, but laboured on to complete a hugely enlarged and, as he intended, definitive edition of his Institutes to leave to posterity. Michael Mullett in his biography of Calvin quotes an admiring contemporary, Theodore Beza, who described him in 1563 as ‘exhausted by labour’ and ‘broken down by suffering’. He had lung trouble, gout and excruciating pain in his kidneys and bladder.